Green Smart Rope access has been chosen as a preferred project partner by being awarded a three-years (July-2015 to July-2018) maintenance agreement with Deyaar to undertake maintenance of Citadel Tower. The tower infrastructure itself is home to major players in the corporate world, allowing businesses to function optimally with all necessary technological and welfare amenities which is strategically located at Business Bay. 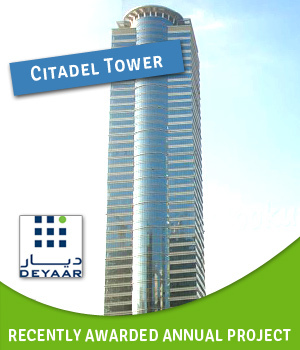 In comes DEYAAR with ‘The Citadel’, an ambitious multi-million dollar commercial project set to become the power center of the corporate world with an astounding height of 50 floors.